But increasing organic web traffic doesn't have to be complicated, and it doesn't have to involve an enormous amount of effort. 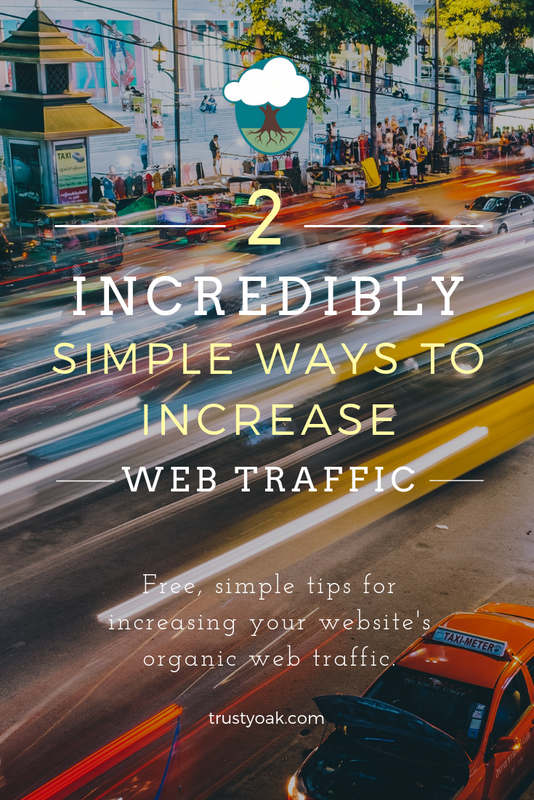 Today, I'd like to share two free ways you can create more organic traffic for your website. Prefer to watch instead of read? Check out Amber's video. These tips aren't complicated, and they don't cost any money, but they'll absolutely increase your organic web traffic! Many business owners jump to creating a website (an important first step, of course), but forget about the other place people find your company when they search the internet: Google listings. It's vital to create a free Google listing for your business. This ensures that when people search for your business on Google, they'll find all relevant information in a handy box (see example). 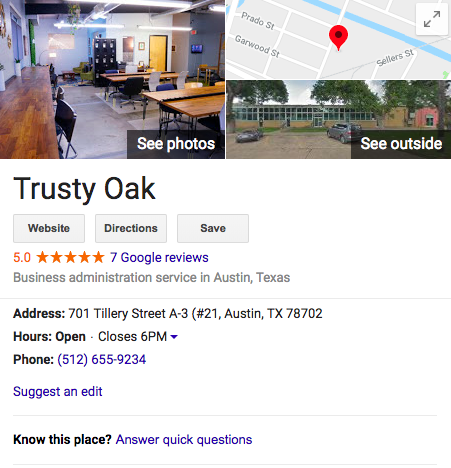 When we created the Trusty Oak Google My Business page a little over a year ago, and we saw an instant increase in our traffic even in the first month. Over time we've continually seen even more organic traffic to our website because of this page, and especially in the beginning, we were able to really tell that's exactly where it was coming from. So, how do you get this box? 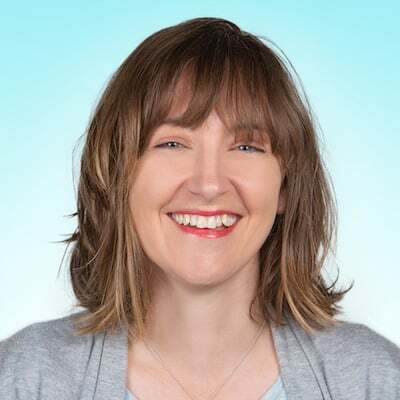 My video walks you through how to create a Google My Business Page (starting at 0:37). 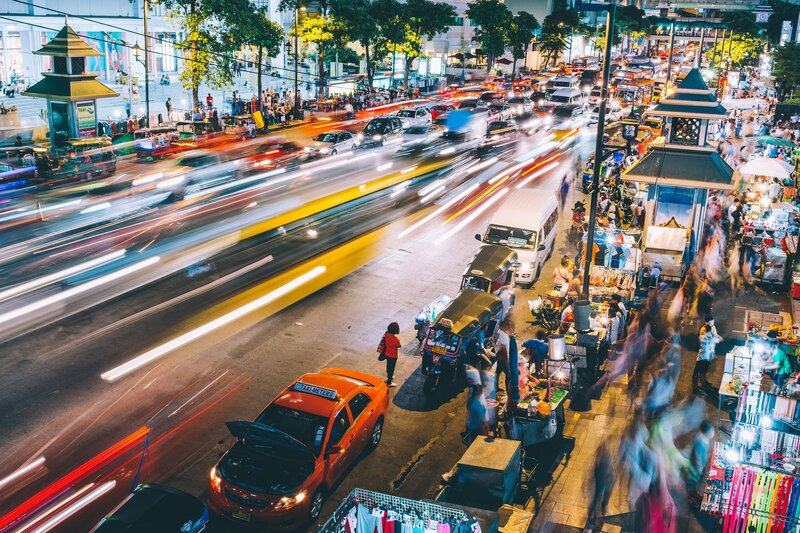 The first thing you need to remember is that you need a physical location associated with your business and it shouldn't be your house, even if you're operating your business virtually. If you're not using a co-working space, you can look into a virtual office space such as Intelligent Office or Regus. This is also important because you'll need to be able to receive snail mail at your business address in order to verify your Google My Business listing. I also uploaded pictures of our co-working space and our team so that when someone is looking at listing they can see other photos from our company and verify they're looking at the right listing. You can customize your listing to show potential customers what you're about. The second way you can start driving organic traffic to your website is by completing your LinkedIn profile. LinkedIn can be an incredible tool in terms of lead generation, but on a very basic level, completing your profiles can have a positive impact on your web traffic. Your customers are using LinkedIn—they're searching for companies like you or directly searching for your business. If they see your employees, you, and your business all have complete, accurate, and active LinkedIn profiles, they'll have more confidence in your professionalism. Your personal and company profiles, as well as those of your team, may also show up in the first few pages of web search results. The main things you want to look at are finishing your profiles with a customized, on-brand banner and filling out all sections of your profile. 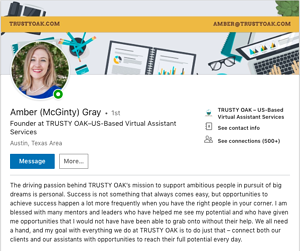 You can create a free banner for your LinkedIn profiles on Canva.com and size it perfectly for LinkedIn. Do this on your personal and business profiles. Make sure your personal profile is up-to-date and lists all relevant contact information for your business. Fill out your summary section so someone can see at a glance what your mission is, what services you provide, and any other important information. You can add videos and articles to your profile to show activity and expertise, and eventually get your profile to the All Star level. With a LinkedIn profile that represents you and your business well, you can absolutely get leads and web traffic from your profile. With these simple, free tips, you'll be on your way to increasing your organic web traffic as you launch your business. A virtual assistant can help with (all) that.